If you're considering online college, you have many school options available to you. Browse our list of fully accredited, U.S.-based colleges offering quality education in a broad variety of subject areas that can lead you to your next rewarding career. Below our school listings, learn more about the basics of online education, including how to find a match among the different types of college and learning styles offered by degree programs. Online two-year and four-year colleges represent some of the most affordable ways to enter higher education. Academic programs at the two-year level provide a solid foundation in the liberal arts and basics within certain major paths. Vocational programs take a more career-oriented track, helping students acquire specific skills they can apply on the job day one. Beyond the material itself, many junior and community colleges and universities have embraced online learning, opening their doors to a more inclusive student body – from working professionals and stay-at-home parents to those who may not be able to commute to a physical campus. The following two-year and four-year colleges offer some of the best combinations of online program volume, breadth, and affordability available today. See who stands out for 2018. Rather not look through schools one by one? Instead of looking through every listing in this table... save some time! Why don't you try our school-matching robot? You can enter a little information about yourself once, and then our robot will match you to schools that are a good fit for you. So you just explore programs that are relevant to you, and don't waste time on programs that are not. The degree programs we find will be flexible, to fit your lifestyle and availability. We'll find programs that are online only, but we'll present some that are online with the option of on campus in your local area too. Click below to get on the fast-track. It's super convenient! Harvard University, a private Ivy League university in Cambridge, Mass., is the top-ranked online college of 2018 due to the high-quality education it provides to students in its 41 online programs. Students enrolled in Harvard’s distance learning programs have access to all the same benefits as their on-campus peers, including counseling services, academic advising, financial aid and tutoring assistance. Just like many of Harvard’s traditional courses, many online classes are transferable to other colleges and universities, giving students the chance to complete their education at whichever location they are most comfortable with. For students enrolled in programs requiring on-campus participation, the Harvard Extension School provides degree, certificate and professional programs in a hybrid format, allowing some credits to still be completed online. For students not pursuing a full degree, Harvard Online Learning offers many free courses open to the public. Presbyterian College, a Christian institution based in Clinton, S.C., with a reputation for academic rigor, offers a large array of programs online. The school’s ethos is around educating the whole person, which translates into an emphasis on critical thinking and communication in its online courses. Courses are offered in a number of different areas, including unique language courses like Greek and Hebrew. The school’s undergraduate offerings include degrees across 42 majors and nine pre-professional programs, while its graduate school focuses on medical fields. While many students enroll at Presby because it’s one of the best colleges for a Christian-based education, there are numerous courses unrelated to the Bible or theology. Regardless of a prospective student’s religious background, the online courses offered at Presbyterian College are carefully constructed to give all students the knowledge they need for their professional career. Drexel University is a private research university in Pennsylvania that currently enrolls over 24,000 students. Drexel students have the opportunity to complete their degree on campus or through a variety of online courses. The online university programs offer the same educational opportunities to students as the campus programs, including financial aid, academic advising, 24/7 tech support and career resources. Students pursuing an online degree from Drexel are instructed by the same prestigious faculty as their on-campus peers. Through Drexel’s Online Partnerships program, working professionals at more than 500 companies can benefit from reduced tuition rates to pursue their degree without leaving their current job. Johns Hopkins University is a well-known elite research university, but it’s not well-known that several degree programs may be completed without attending the school’s Baltimore, Md., campus. In addition, JHU offers dozens of classes online that can supplement traditional in-person courses as part of a degree program. The breadth of options available to online learners is just one aspect of what makes Johns Hopkins one of the best options for online college. Some of its courses and credits are even free and available for all students regardless of enrollment. The JHU admissions office is willing to work with any incoming transfer student to find any applicable areas for transfer credit to be utilized. Northern Arizona University is a large public university in Flagstaff, Ariz., with a strong reputation in its online offerings. With degree programs available at the bachelor’s and master’s levels, students who do study online are able to work toward their degrees while receiving the same quality education they would get on-campus at NAU. The school offers an innovative Personalized Learning program, where students pay a flat subscription rate over 6 months, with no additional fees, not even for books -- an attractive option for many students whose employers are picking up the tuition tab. Students at NAU also benefit from the school’s focus on career readiness in all its degree programs. Mary Baldwin University -- a smaller, private liberal arts institution in Virginia’s Shenandoah Valley -- has cultivated a niche in helping professional adults earn their degrees later in life. Mary Baldwin’s online courses and programs can help students move forward in their careers without making sacrifices to other obligations. MBU’s online degrees are a popular option with many students due to the university’s credit transfer policy: Mary Baldwin allows transfer of up to 90 credit hours, cutting into the cost of earning a degree. With over 200 degree programs offered online by Southern New Hampshire University, it’s easy to see why many consider it one of the best online colleges for students looking to improve their careers. Each online degree program is designed to help students improve or change their current professional position. With the aid of affordable tuition and the flexibility to study at their own pace, students find that SNHU not only meets their expectations, but offers more than they thought an online school might: they also get access to the large SNHU alumni network, which can help them secure a new job after graduation. SNHU is among the best online schools in terms of services available to virtual students, which include an online library, tutoring and around-the-clock support. Many students find that the best online colleges are the ones that allow them to study at their own pace – even if that means completing a degree faster than normal. Concordia University, Wisconsin does just that with their accelerated learning programs, allowing online students to study at a faster pace. For students who have a busy schedule and prefer to study at a more traditional pace, there are over 50 different online degree options offered by Concordia. Concordia is also one of the best online schools in terms of transferring credits, including military and work-related experience. Students can study toward a bachelor’s degree, master’s degree or, in some instances both, such as with the RN to MSN program that accelerates nurses to a master’s degree. At Indiana Wesleyan University, students can receive an affordable and convenient education via the school’s online degree programs. By taking advantage of one of Indiana Wesleyan’s online programs, students will be able to complete their academics at a pace with which they are comfortable. Just like their on-campus peers, online students have several opportunities to receive financial aid to make earning a college education a less stressful pursuit. Online students will also receive all necessary support from the Indiana Wesleyan University faculty and staff. Faculty members have several years of experience in teaching online courses and are prepared to help all incoming online students reach their goals. IWU offers all students a generous credit transfer policy and has degree completion programs which can help students finish their bachelor’s degrees in as little as 10 months. Graduate students may be interested in continuing their education with an online program offered at Columbia University in the City of New York. The school’s online programs lead to either a master’s degree or a graduate level certificate of professional achievement, and the Columbia also offers many free learning opportunities through MOOCs and other online programs. Online students who wish to integrate with their campus community may wish to consider studying in a hybrid format, which will allow the student to spend half of their time at home and the other half on the Columbia University Campus. Hybrid students will have more schedule flexibility, as well as the option to participate in campus clubs and organizations. Fitting school into a busy schedule is rarely a simple process; that’s why North Carolina State University at Raleigh offers several of their programs in a format that can be completed from a distance. NC State currently offers more than 90 degrees and certificates and more than 350 different courses fully-online, meaning students can fit earning a degree into their lives more easily. Students taking online courses will have opportunities to make use of facetime with their professor through video chat sessions, and will participate in discussion boards that will allow them to socialize with their peers. Online students are eligible forfinancial aid. The online degree programs offered at East Carolina University utilize a course management system that ensures convenient accessibility for both the student and their professor. Several programs offered at ECU can be completed without ever attending any traditional, in-person classes, but some students prefer splitting their time between campus and home. This kind of hybrid program is beneficial for its flexibility, but still allows students to build the social connections that make the college experience truly rich. From point of enrollment to graduation, online students will receive academic support from several departments, including academic advisement and online tutoring to aid in their success. Saint Mary-of-the-Woods College is one of the best online schools with to earn a bachelor’s degree. With over 40 years of experience in teaching through a distance learning program, Saint Mary-of-the-Woods has crafted an online program that works for most undergraduate students. Each degree is created with a busy student in mind, whether working adults or people that have family obligations. Some of the popular undergraduate options include the RN to BSN or health administration. While some programs are offered entirely online, other degrees can be completed through a hybrid of on-campus and online studies. SMWC is also among the best online colleges for graduate degrees, with all of their master’s degree programs being offered entirely online. Nova Southeastern University’s distance program doesn’t just serve students at one of the remote campuses, but also students that are studying online. Nova Southeastern University offers their online courses as part of the Southern Regional Education Board’s Electronic Campus program, meaning that each course offered online is fully accredited. 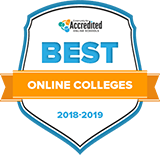 This rigorous accreditation makes Nova one of the best online colleges in Florida for students that are looking for a high-quality education. Nova offers undergraduate and graduate degrees, some of which have earned the school distinctions. For example, Nova is considered one of the best online schools for graduate nursing, graduate education and criminal justice, all of which are already popular fields for online students. University of Florida students benefit from some of the best online programs in the country: many of their over 100 online programs consistently rank top in the nation. Incoming transfer students will be able to put many of their previously earned credits to use at the University of Florida, ensuring the completion of their degree will involve as little backtracking as possible. Incoming freshman can get a leg up while easing into college with UF Online’s PaCE Program, which allows them to begin school online and later transfer to on-campus programs. Saint Leo University’s online program is designed to help nontraditional adult learners succeed by making higher education more accessible. In the virtual classroom, students will receive a comprehensive education in their field of choice that are taught by dedicated instructors who are trained specifically to teach online courses. While the school was built with Catholic roots, online learners are welcomed into this learning community regardless of their religious affiliation. Before beginning their online courses, students may also receive a free e-book that contains tips to succeed in an online learning environment. One of the goals at George Washington University’s online school is to educate leaders. They understand that the best online schools are the ones that teach students everything they need to succeed, both right after graduation and in the future. Students that do end up studying toward an online degree at George Washington will find that the curriculum goes beyond the degree they’re earning. There are online options in most fields, and degrees are available at various levels. However, the graduate degree options are what sets George Washington apart from other online colleges. George Washington is home to many well-respected online programs, and they are considered one of the best online colleges for earning a master’s degree in public health. A distance-learning degree earned at Texas A&M University can provide students with the same tools for success that are available to students attending classes on campus. Current, fully-online offerings include 47 graduate degrees and 25 different grad certificates. As one of the best online schools, Texas A&M prides itself on ensuring that virtual students feel as much a part of the Aggie family as their on-campus peers; all online students are eligible for the same school-provided networking opportunities. Financial aid and scholarships are available to online Aggies as well. Not only does Siena Heights University offer some of the country’s best online degree programs, but students are also able to select from four minors that can be completed online as well. More than 80 full-time faculty members are employed at Siena Heights University, several of which have many semesters of experience teaching online students. A great many of Siena Heights students receive financial aid in some form, be it scholarships, grants, or federal aid, and online students are included in financial aid opportunities. Online students may also wish to study in a hybrid format, and split their time evenly between home and the Siena Heights campus. Online education should be available to anyone with access to the internet, something that Pennsylvania State’s World Campus understands. Created 20 years ago for students that couldn’t commute to campus, the World Campus has grown into one of the best online colleges for international students. Students from around the world, including military members, can choose from the over 150 degrees and certificates offered, all of which are designed to give students the knowledge they need to succeed in their future careers. As with most online schools, Penn State has many options for those pursuing a master’s degree. However, there are also plenty of online bachelor’s degrees offered as well. With the size and scope of the program, it’s easy to see why it’s considered one of the best online schools for students at all levels. Both bachelor students and graduate students have the opportunity to complete an entire degree online while studying at the University of Denver. These programs are perfect for students with jobs, students in the military, or students who have familial obligations that need to be put first. Online students at the University of Denver will be learning from experienced teachers who are prepared to make learning in a virtual environment as approachable as possible. The school offers certificates, bachelor’s and graduate degrees online, and its University College is dedicated to helping adult learners complete their studies. Online students have the opportunity to take advantage of all resources provided for traditional students. Fort Hays State University has established itself as one of the best online colleges, largely due to their affordability and quality of education. Each program is designed to give students the knowledge they need to enter the global community as a leader and expert. This can be seen with their online bachelor’s degrees, all of which are fully accredited. Popular bachelor’s degree options include criminal justice, elementary education and accounting. Along with their bachelor’s degrees, Fort Hays also has extensive master’s degree programs that give students the experience and knowledge they need to make a leap in their career. The best online schools are the ones that prepare students for their future, and Fort Hays does just that. Learning in an online program at Prescott College promotes self-discipline, accountability and a strong sense of initiative. Not only does the faculty in charge of online classes have several semesters of experience teaching in a virtual format, but that also have several years of professional experience, ensuring students will be learning the skills they need to succeed in their future careers. Prescott offers online certification programs, as well as bachelor’s and graduate degrees fully-online. If a student chooses to study in a hybrid program, they may also choose to use their extra campus time to participate in a number of campus activities. Hampton University helps busy students find the time to further their education with several web-based degree programs. Students studying online can either complete all of their work from home, or they have the option to split their time between in-person classes and online work. While these hybrid students have the opportunity to participate in on-campus activates, online students will be able to make use of all of Hampton University’s student services. Online tutoring is available, and personal academic advisors are ready to provide students with the quickest path to their success. Webster University offers online programs at the certificate, baccalaureate, and graduate level, all of which vary through several fields of study. Students taking online classes will be able to construct their own schedules and complete their coursework at their own pace. Further freedom of schedule is available for students completing their work part-time. Students also have the choice of completing their classes in a hybrid format, splitting their academic time between home and the Webster University campus. Online students will also be provided with all necessary student services to secure their success, including career counseling and tech services. Oregon State University has done an excellent job of creating one of the best online colleges in the nation. With over 1,100 courses offered entirely online, there’s no shortage of options for students. Most students who study through the online school choose to pursue one of the 45 online degree programs. However, online is also a popular option for students that want to combine online courses with on-campus courses, either to bolster their education or finish their degree faster. OSU has a proven track record with their online education as well, and they have over 21,000 students worldwide who are studying online. Whatever students are looking for out of their college experience, OSU has made itself one of the best online schools for people from all walks of life. The best online schools don't just teach students and give them a degree – they also see the students through school and help them along the way. Stevens Institute of Technology has spent a lot of time on their online program, making sure that it’s one of the best online colleges in New Jersey. There are plenty of programs available, including 17 different master’s degrees, all of which are fully accredited and available entirely online. Along with their different programs, Stevens also offers students additional benefits. For example, their online platform is considered one of the best, making it easier for students to learn and earn their degree. Students also have access to instructors and often collaborate with other students, making their online program feel more like a traditional college experience. One of the best online schools for students that want to become teachers, National University offers various degree programs at the bachelor’s and master’s level. To set itself apart, National doesn’t just offer degrees that can be completed entirely online – they also offer degrees that lead to certification, bringing students one step closer to their future career. The online schooloffers bachelor’s degrees in education that lead to licensure. For example, students can earn a bachelor’s in English education while receiving Nevada state licensure, or the same degree with credentials in California. Students can expect the same type of professional readiness from all their programs. College degrees aren’t just about becoming educated, and National University understands that the best online colleges prepare students for their career. Several degree programs ranging from bachelor’s to master’s are offered at the Illinois Institute of Technology. Because online learning puts a lot academic control into the hands of the student, they are able to further develop their initiative, time management skills, and self-discipline. Course material is delivered directly to students, allowing them to choose the best time to complete their work. Student services such as tutoring and academic advising will be provided to online students to make sure they are staying on the right path to receive their degree. Just like traditional courses, online classes at IIT are fully accredited. Colorado State University is seen as one of the best online schools in Colorado to earn a master’s degree. Each master’s degree is taught by experienced faculty that understands what students need to know to succeed after college. Also, graduate students can study at their own pace, great for students who are working. But education goes well beyond the degree, and CSU’s online school offers plenty of supplemental courses to help students get the education they want and need. Free courses are offered entirely online, and students can also work on their soft skills, which help in day-to-day professional life after school. Bachelor’s degree programs are offered entirely online as well. With their various resources, Colorado State is among the best online colleges for earning an all-around education. By utilizing the University of Virginia's distance learning program, students are able to stay on top of their daily commitments while still working towards a college degree. Multiple online programs are available at various levels of study, from full bachelor degree programs to grad-level certificates. These programs can be completed with a fully-online approach, or students could choose to spend part of their time studying on campus with a hybrid program. Hybrid students will be exposed to the rich academic culture that has developed at The University of Virginia, and have the opportunity to live in modern and comfortable student housing, join one of UVA's numerous student organizations, and attend campus events. Most students who study online are looking for a high-quality yet flexible program – the aspects that make Wayland Baptist University one of the top online schools in Texas. Their online school acts like any other school within a college, and they put their online students first. Students that do end up studying at WBU online to earn or complete their degree also receive a private, Christian education, instilling Christian ideals in students. This gives a more well-rounded education, something that goes on to help students throughout their careers. While students can earn or complete their bachelor's degree entirely online, most students come to WBU online to earn a master's degree. Each is fully accredited, and they offer the same WBU education as their on-campus programs. The school's history and dedication to their core values place them among the best online schools to get a Christian education. Students attending Canisius College have the choice to complete their master's degree or graduate certificate through a wide variety of online courses. Some degrees can be completed in either entirely an online format or in a hybrid formats, giving students the unique opportunity to design their academic schedule to fit into their everyday lives. Students who choose to study in a hybrid format may also engage in numerous campus activities, including several student-run clubs, Greek life chapters, and intramural or club sports teams. Online students can be assured that they will receive the same education in their virtual course a traditional student would receive in a Canisius College classroom. Students studying at Champlain College may take advantage of a wide variety of online course offerings to expedite their academic career. With more than 50 programs offered in a 100 percent online format ranging between certificate, bachelor's, and master's programs, students of all levels may supplement their education with coursework completed entirely from home. Champlain College may accept up to 90 credits of transferable credit from other institutions, guaranteeing that prior scholarly effort will be recognized and students may not need to repeat previously completed courses. Certain online courses taken with Champlain College also may be transferred to other institutions. In order to be one of the best online colleges, an institution must provide the tools students need for success. Western Kentucky University does just that by providing an in-depth orientation through its Online Learning 101 program-where students learn how to use the school's learning management system-and a robust Student Resource Portalwhere people can get the extra help they need with research, writing, and math. In addition, the school offers a variety of graduate and undergraduate degree programs. On the undergraduate level, students can get an associate's degree in interdisciplinary studies and early childhood education and a bachelor's degree in sociology, criminology, health sciences, and organizational leadership. On the graduate level, students can earn master's degrees in biology, recreation and sport administration, history, mathematics, and social work. In 2018, U.S. News and World Report named Clarkson University's online MBA program among the best in the country. With its robust coursework in global supply chain management, leadership and organizational behavior, marketing management, managerial economics, and financial management-as well as the ability the earn a dual MBA/MS in Data Analytics if students choose to take additional classes in areas such as data mining, information visualization, optimization methods for analytics, probability and statistics for analytics, database modeling, and design and implementation-it's no wonder Clarkson University is among the best online schools for students to sharpen their business acumen. In addition, the school offers online graduate degrees in civil and environmental engineering, clinical leadership in healthcare management, computer science, data analytics, and mechanical engineering. Whether someone is a veteran or currently in active service, Davenport University is among the best online colleges students in the military can choose. This military-friendly school allows students to get credit for their work experience, as well as easily take a leave of absence if they are deployed. In addition, the online school offers military student support services, such as counseling, tutoring, and a system to conveniently find information from the Veterans Administration and Department of Defense. For the civilian, Davenport University also offers services to online students including technical support and guidance about coursework. On the graduate level, students can earn online certificates in forensic accounting, health care management, strategic management, and internal auditing, and master's degrees in management, business administration, and accountancy. At the University of Alabama, non-traditional learners can reach their academic goals through online courses and degree programs. Fields of study include law, nursing, business and arts and sciences along with many others to meet the increasing demand for non-traditional learning formats. Students can research and enroll in their courses through the school's online portal, myBama and then access e-course content through the online learning management system, Blackboard. A technical support team is also available for help with technical issues or general technical questions. Illinois Online, which is available through the University of Illinois at Urbana-Champaign, is one of the best online colleges for adult learners and traditional students alike. One of the reasons the school receives such high marks is because of its Center for Innovation in Teaching and Learning, which is a one-stop shop for online students to get their questions answered about the distance learning experience. Academically, the school offers dozens of online degree programs, including a bachelor's degree in earth, society, and environmental sustainability and master's degrees in aerospace engineering, translation and interpreting, strategic brand communication, executive human resource development, and food science and human nutrition. There are also certificate programs available on the undergraduate and graduate levels. Students who want to take advantage of Illinois Online without enrolling in a degree program can also choose from dozens of massive open online courses. Since the school was founded in 1838, Judson College has been dedicated to preparing students for service. For those who want to integrate their faith into their college coursework, Judson College is one of the best online schools thanks to its focus on Christian principles that are fostered through events designed to provide spiritual growth, Bible study, and mentoring groups. The school also ensures that it feeds students' minds as it feeds their soul by offering a variety of academic programs in the areas of sciences, humanities and fine arts, professional studies, and social sciences. For example, the school offers degree programs in religious studies, nursing, biology, equine science, criminal justice, history, and elementary education. One has to look no further than the student success stories posted on the University of Southern Mississippi's website to understand why it's among the best online schools, as it has provided students from different backgrounds the opportunity to obtain a quality education that fits their lifestyle. In addition to providing convenience, the school also gives students variety in terms of the degree programs they can choose from. For example, on the undergraduate level, students can earn bachelor's degrees in areas such as interdisciplinary studies, industrial engineering technology, library and information science, special education, child and family studies, and applied technology. In addition, prospective graduate students can choose from master's degrees in public health, instructional technology, kinesiology, nutrition and food systems, and library and information science and doctoral degrees in nursing leadership and international development. Also, there are graduate certificates in management of child nutrition programs, sport security management, youth services and literature, and archives and special collections and undergraduate certificates in management of child nutrition programs and casino management. The distance learning program at the University of Cincinnati began in 1984 with an open learning program for firefighter advancement. Now, distance learners are able to enroll in degree and certificate programs and individual courses that can be completed entirely online and off-campus. Before beginning their e-courses, students must first complete a self-guided orientation to online learning where they will learn strategies for academic success in the virtual classroom. Distance students are also provided with access to academic advising, proctoring, tutoring and technical support resources. The university offers a variety of free and paid MOOCs to students as well. The University of Illinois at Springfield has been recognized by U.S. News and World Report as one of the best online colleges for its bachelor's programs, as well as its MBA. Part of what makes the University of Illinois at Springfield a good choice is its partnerships with numerous community colleges, which allows students to easily transition from associate's degree programs to higher-level degrees. In addition, there are 2+2 Agreements that give students the opportunity to begin their bachelor's degree programs as they're still working on their associate's degree. And once students do transition into the school, they can earn a variety of graduate and undergraduate degrees. For example, the college has bachelor's degrees in history, psychology, math, computer science, and philosophy, as well as master's degrees in education, public health, legal studies, political science, and data analytics. Tiffin University understands the unique needs of working adults, which makes it among the best online colleges for students who need to juggle their education with working a full-time job and raising a family. With flexible programs that begin six times per year and the ability to take courses at a pace that makes sense for their lifestyle, Tiffin University allows adult learners to obtain the education they need to get ahead while not missing a step in the other areas of their lives. Students can earn bachelor's degree in subjects such as criminalistics, psychology, system administration, and health, fitness and wellness. On the graduate level, there are also master's degree programs in art and visual media, forensic psychology, crime analysis, and teaching art. In addition, the school offers graduate and undergraduate certificate programs. Concordia University-Chicago is one of the best online colleges for students who want to combine a liberal arts education with the tenets of the Lutheran tradition. As one of only 10 schools part of the Lutheran college system, Concordia University-Chicago has a long tradition of promoting the faith and helping students explore their spirituality as they complete their degrees. As a result, the school has been listed multiple times on the President's Higher Education Community Service Honor Roll for the acts of service performed by students, professors, and staff. In the classroom, the university has a variety of degree programs, including bachelor's degrees in human resource management, organizational management, kinesiology, sports and recreation management, and health care management. Those who want to earn a graduate degree can enroll in the school's grant writing, management and evaluation, religion, leadership studies, early childhood education, and curriculum and instruction master's degree programs. At Case Western Reserve University, students who want to become leaders in their field don't necessarily have to enroll in the school's degree programs to do it. Thanks to its massive open online courses in various subjects, the university is among one of the best online schools for leadership development training. In addition, students who want to enroll in an online degree program can also get the training they need to be successful. For example, the school's social administration master's program is designed for those who want to take leadership roles in the social work field. To that end, the school allows students to choose which area they want to focus on-such as community practice for social change; children, youth, and families; and adult mental health-so they can develop the specific skills that are appropriate for their career goals. In addition, Case Western Reserve University has online master's degree programs in mechanical, civil, systems and control, and biomedical engineering. Online students attending Lehigh University can receive a well-rounded education that will help them to obtain a position in their field of interest. Online learning at Lehigh is characterized by specialized virtual programs, experienced faculty members, and convenient accessibility. Students will be able to stay in contact with their peers and professors through video chats, discussion boards, and emails. If a student is looking to experience a more traditional college experience, but also wants to maintain the flexibility of online learning, they may wish to consider dividing their study time between home and school with a hybrid program. Being able to learn in a comfortable environment is often one of the greatest keys to student success. That's why LeTourneau University gives students the chance to complete their coursework from the comfort of their home with one of their numerous online degree programs. Online classes are fully accredited and can lead to the same careers achieved by taking traditional classes. Also like traditional classes, online classes offer the same opportunities to be transferred, if a student decides that he or she would like to finish their education at a different institution. Full-time faculty teaching online classes have many years of field-specific training. Several online programs, ranging from certificate to graduate, are available to students enrolled at Southwestern College. Online students may choose to complete one of these programs without ever having to actually be present on the Southwestern College campus. Other students interested in online learning may wish to consider a hybrid learning format, where they will split their academics between online and in-person learning. Hybrid students can make use of the flexibility afforded through online learning while also participating in many of the extracurricular activities available on the Southwestern College campus. Online classes are just as likely to be covered by financial aid as traditional courses. Accredited by the Western Association of Schools and Colleges Senior College and University Commission, California Baptist University is one of the best online schools for students who want to find their spiritual, social and professional purpose in life. Founded by the California Southern Baptist Convention in 1950, the school encourages students to practice the skills they learn in the classroom with integrity and glory to God. To that end, the school offers a variety of online degree programs that are catered to adult learners looking for quality, flexibility, and Christianity in their education. California Baptist University has bachelor's degrees in public relations, kinesiology, English, human services, Christian ministries, and psychology. On the graduate level, students can study technology management, public administration, counseling psychology, organizational leadership, and communication. The search tool below has been designed to help simplify the process of comparing online colleges and programs. Users can evaluate distance learning options based on important factors such as enrollment, tuition, and academic program availability. Armed with this information, students can make an informed decision about which online university fits their personal, educational, and professional needs. The number of online learning options continues to grow across majors, with students earning degrees in accounting, criminal justice, psychology, and even nursing. While online programs have core elements across these majors, each one requires a targeted content and delivery to ensure graduates have the flexibility they need without sacrificing quality. Browse the pages below to learn how online education works in each major. Although online learning has removed many time and place barriers, it’s important to see which colleges in your state offer online programs. Attending a local college or university with online programs makes it easier to take advantage of physical resources or, if necessary, enroll in a hybrid program. Select a state below to learn more about its online learning landscape. To be successful, prospective distance learning students need to match their lifestyle, learning style, academic aspirations, and ultimate career goals to their program of study and higher education institution. As with traditional, campus-based options, students should understand the different types of online programs available. These different options cater to a diverse range of students. The table below can help distance learners discover what type of learning environment may be right for them. Lower tuition rates – average tuition for public community colleges was $3,347 in 2014-2015. Flexible scheduling – community colleges typically design class schedules with working professionals and individuals with families in mind. Academic variety – community colleges offer credit and non-credit programs in a wide range of disciplines. Lack of academic award choices – two-year colleges traditionally only offer diploma, certificate, and associate degree programs. Fewer career options post graduation – students with associate degrees may be eligible for a narrow selection of careers. Some fields and/or career titles require a bachelor’s degree at minimum. Students pursuing vocational or professional development skills specific to an occupational field. Students seeking additional training or certification. Those seeking to save money on general education classes before transferring into a four-year college. Affordable tuition – the tuition for four-year public universities was $9,139 in 2014-2015. Larger breadth of education – four-year public universities offer a wide selection of majors, minors, and academic specializations. Multiple academic choices – students can select from bachelor’s, master’s, and doctoral degree options. Limited class availability – because of the size of public universities, some classes may have a limited number of offerings for each course and popular classes may reach capacity quickly. Less individualized attention – due to large class sizes, it may be difficult for professors to give every student individualized attention and guidance. Students who want a well-rounded education. Students that want a wide selection of degree options in a variety of academic disciplines. Smaller enrollment sizes – the average student population of private, non-profit institutions is 1,900. Shorter completion time – on average, students graduate in four and a half years versus six years at public universities. More financial aid opportunities – private, non-profit universities typically have competitive financial assistance packages, strong alumni donor support, and additional scholarship opportunities. Higher tuition rates – the average tuition for a private four-year college was $31,231 in 2014-2015. Stringent admissions requirements – private colleges are typically more competitive and selective when it comes to applications and admission. Fewer online options – the most recent data from AASCU shows that public universities offer double the number of online programs than private nonprofit colleges. Students who wish to attend a more selective institution that may have greater prestige in the job market. Students who are high academic achievers looking for a challenging program of study. Timing Self-paced, or asynchronous learning, is a form of instruction where students study at their own time and pace. In this format, students and teachers may not interact in real-time and instruction is conducted through self-study elements such as pre-recorded lectures, individual assignments, and reading course materials. Real-time, or synchronous learning, is a form of instruction where the instructor and students are present at the same time. Instruction is facilitated in real-time by a teacher and includes traditionally classroom-based elements such as group discussions, team projects, and lectures. Online whiteboard to share ideas and collaborate. Accreditation is a voluntary process of review and regulation that ensures higher education institutions offer programs that meet acceptable quality standards. The Department of Education oversees accreditation, but it does not conduct the actual review process. Institutions pursuing accreditation undergo a rigorous review process, which includes the examination of elements such as curriculum planning, course offerings, faculty, admissions standards, graduation rates, facilities, and financial resources. Accredited institutions and programs must undergo regular evaluation to ensure compliance with the standards set forth by the accrediting bodies. Online learning is transformative, not only reshaping how students learn, but how colleges and universities deliver instruction. Non-profit colleges and universities (both two- and four-year) have quickly adopted online education as a way to improve academic access and program diversity for students. Furthermore, the growing acceptance of online learning at non-profit colleges is important because—in most cases—non-profit colleges represent the best educational choice for adults who have jobs or family commitments that preclude traditional campus attendance. According to research from the American Association of State Colleges and Universities (AASCU), more than 80 percent of public universities and at least half of private colleges offer online programs. A 2014 study from the Babson Institute estimated that 71 percent of all public-, degree-granting institutions provide distance learning opportunities to students. The most recent data from the National Center for Education Statistics reveals that approximately 2.6 million college students enrolled in fully online degree programs, while more than 5.5 million students were taking at least one online class. In 2013, according to AASCU, 65 percent of online students attended a nonprofit college and of those students, 45 percent attended public colleges and 20 percent attended private nonprofit institutions. Although enrollment in online degree programs has continued to tick upwards during the past decade, it has recently slowed in the past few years. However, both public and private not-for-profit colleges and universities continue to experience respectable increases. From 2012 - 2013, research from the Babson Institute shows that enrollment in online classes rose nearly 5 percent at public institutions and almost 13 percent for private nonprofits. Here’s a closer look at the growth numbers by volume for online learners by institution type in 2013. Based on the numbers, it’s clear that nonprofit online colleges are doing something right, and in a big way. Students are turning to these educational options in droves, thanks to several key areas in which online colleges are out-pacing their brick-and-mortar counterparts. Based on nonprofit universities that offer online programs, healthcare-related fields of study and business are the two most commonly offered academic programs at AASCU institutions. The table below outlines the common fields of study offered online by AASCU non-profit institutions. According to the most recent market research from Eduventures (2013), the bachelor’s degree remains the most popular online degree option. According to their study, 42 percent of students choose a bachelor’s degree, 29 percent are enrolled in online associate degree programs, and 24 percent are in master’s degree programs. To a certain degree, online degrees have had a persistent stigma—a reputation that they are not on-par with those earned on-campus. However, the tide seems to be shifting because non-profit colleges (both private and public) have created online programs that rival those traditional degrees. In fact, a recent study shows that 76 percent of academic leaders agree that degrees taught online are equal to their on-campus counterparts. A central reason for the increasing demand for online education is flexibility. Whether the student is seeking to go back to school, is a recent high school graduate that wants to attend a college in another state, or is a career advancer who wants to pursue a graduate degree, online college allows them to complete an education on their own terms. Online education helps students to craft a schedule that fits their lives, which is typically not possible in the traditional classroom. School can be woven into the student’s working and home lives instead of the other way around, making online classes the number one option for many in pursuit of a higher education. Students, regardless of state of residence, will often enjoy in- state tuition costs when enrolling at an online college. Savings can also be found in the form of living expenses, like dorm and travel costs, as well as lowered costs for class and study materials, which can instead be obtained virtually. Online education’s legacy will be access—it has fundamentally altered how, when, and where students learn. Students can use the resources below to access free college courses from respected universities and private companies, get help with various academic subjects, and connect with other online students. 2U partners with universities, such as the University of North Carolina, University of Southern California, and Washington University in St. Louis to deliver online degree programs. Alison offers online courses at both the certificate and diploma level in subject areas ranging from accounting to manufacturing, finance to information technology. BookRags is an online learning portal where students can find study guides on works of literature and get help with essays. Through Brigham Young University, students can take free, non-credit courses online in subjects such as family history, music, mathematics, and religion. The University of California-Davis created the ChemWiki, an online collaborative hub that includes open access learning materials in chemistry from higher education institutions such as Acadia University, Colorado State University, and Howard University. CourseBuffet aggregates MOOCs and online college courses from universities across the country that partner with organizations such as Coursera, edX, Saylor, and Udacity. Coursera is a company that partners with universities, ranging from Duke University to Yale University, Rutgers University to Rice University to offer free online courses to students in nearly every subject. edX is an online educational platform that partners with schools and universities to offer real online courses at the student’s convenience. London’s oldest college, Gresham College, provides free online access to recorded lectures from renowned professors from around the world. JHSPH Open offers free online materials from hundreds of public health courses from faculty members at Johns Hopkins University. Khan Academy is a nonprofit organization that provides access to online courses in subjects such as math, science, history, and computer programming at no cost to students. KnowledgeNet provides online instruction in IT fields that includes access to recorded lectures, an e-library, and self-paced learning materials. The Massachusetts Institute of Technology offers a free, on-demand selection of non-credit courses that are nearly identical to the courses that are taught on-campus. The Online learning Consortium is an organization that provides offers professional development and instruction online to educators across the world. Open Culture is an educational media hub for individuals looking for online learning options such as MOOCs or open courseware materials from universities across the country. A global community of education associations and higher education associations, the Open Education Consortium advocates for open education and offers online learning resources and online courses in a variety of different languages. Carnegie Mellon University’s Open Learning Initiative is a self-paced, self-study collection of online courses. Yale University offers free access to a range of introductory non-credit courses taught at the University that students can access without registering. OWL is the online writing lab at Purdue University that has a comprehensive collection of free writing resources. Saylor University is an online learning site that offers a variety of certificate programs (not accredited) in different subject areas. Stanford on iTunes is a free collection of video and audio content, such as lectures and faculty presentations, from programs across the university. A project from Drexel University, the Math Forum where students can get math assistance, access high quality math content, and participate in discussion groups. Students can access a wide array of online, self-paced non-credit course materials at no cost through Tuft University’s Open Courseware. Udacity offers access to online courses that focus on real-world, professional skill development through partnerships with industry leaders such as Google, Facebook and Salesforce. Udemy is an online learning marketplace where students can access more than 30,000 self-paced, online courses taught by expert instructors. The University of Massachusetts provides an open education resource that offers free non-credit college courses that include a syllabus and assignments. Students can take online non-credit courses for free through Open Courseware at the University of Notre Dame. The University of Washington provides free online non-credit courses through partnerships with Coursera, edX and Canvas Network. The Open Courseware program at Utah State University offers a variety of education materials that complement formal on-campus courses, which students can access for free online. Through YouTube and iTunes U, students can watch real class lectures from 2009 to 2015 at no cost and without registration.